The Macau government has recently announced a new bill that may see an outright ban on gambling for those working in the casino industry. This would include both casino-floor workers as well as resort employees. 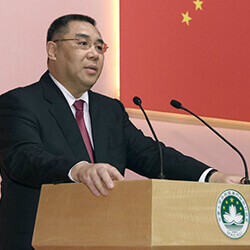 Fernando Chui, the Macau Chief Executive has proposed a prohibition on gambling to casino dealers and almost all those directly involved in gambling operations from betting during the times they are off work. This ban would further extend to those workers that are currently employed by any large casino properties. Although the ban for casino workers has long been expected, the expansion of the ban to include other resort workers has left many surprised. Some organisations, such as The Gaming Inspection and Coordination Bureau has told reporters that they support the potential ban. The legislation itself was created and tailored by Chui and his Executive Council, and will now head off to the Legislative Assembly for consideration. Part of the reason for the ban is the proximity to games and the in-depth knowledge that workers accumulate due to their time spent on the tables and machines. They believe that workers might feel that they have an upper hand when it comes to betting due to their insight, and may create a dependency for the workers who attempt to gamble more frequently. Most expect that the Legislative Assembly will most likely pass the bill before the year is over, effectively putting the ban into place.